Maximum size: about 4 mm. Identification: The head and body of this aeolid are translucent-cream (perhaps, with an orange tint) frosted with opaque white. The cerata are dark, olive-green basally and iridescent blue medially with peach cnidosacs showing through their transparent tips. Their surfaces are irregularly frosted with white. The rhinophores are translucent orange basally and white apically while the cephalic tentacles are white. Natural history: Tenellia sp. #23 is known from a single animal found at an exposed rocky site. It was on a cavern wall near an entrance at about 11 m (35 ft). It may feed on the hydroid with which it's associated in the photo. 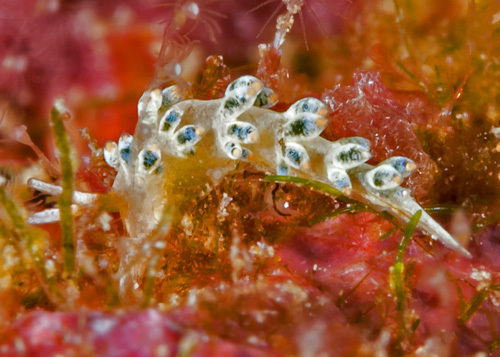 Taxonomic notes: It was first recorded in Hawaii from Firehouse, Oahu by David Rolla on July 3, 2016 and was formerly placed in the genus Cuthona. Photo: David Rolla: about 4 mm: Firehouse, Oahu; July 3, 2016.